In memorium – John Harney 20 August 1930 to 16 June 2014. The English Tea Store, owner of this blog, has been proud to carry a selection of the teas from a tea company that has become quite well-known here in the U.S. – Harney & Sons. Recently, John Harney, founder of this company, died. He will be greatly missed but certainly leaves behind a legacy and a family who can carry on. In 1960, Stanley Mason, an English gentleman and owner of Sarum Tea, met with me at the White Hart Inn, where I was general manager and a partner, and asked me to serve his tea in the inn. People asked daily where the tea could be purchased. I sent guests to Stanley’s home, where Stanley could be found packing teas. In 1967, Stanley convinced me to serve only loose-leaf tea at the inn, then unheard of in the United States. Again, people wanted to purchase the tea. I knew I was on to something. In 1970, I bought Sarum Tea, and Stanley Mason became my mentor. The apprentice period lasted 10 years, until Stanley passed away in 1980, at the age of 80. In 1978, I sold tea to my first hotel, the Ritz-Carlton in Boston. They purchased English Breakfast, Earl Grey, Darjeeling, Assam, Gunpowder, and Chamomile—the full Sarum Tea line! Harney and Sons Tea – Earl Grey Imperial – Part of their distinguished line of historical English blends which were created especially for the Historic Royal Palaces of England. A blend of fine black teas, rich in natural Bergamot. 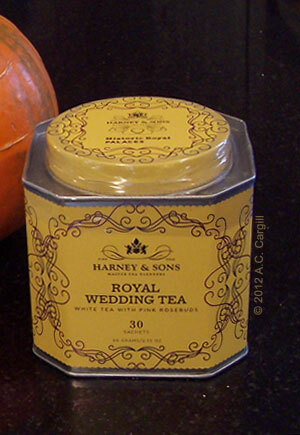 Harney and Sons Tea – Hot Cinnamon Spice – Their most popular flavored tea. An assertive blend of black teas, three types of cinnamon, orange peel, and sweet cloves (no sugar added). Harney and Sons Tea – Vanilla Comoro – Decaffeinated Vanilla Black Tea! Now you can enjoy this popular dessert tea to your heart’s content, and still get a good night’s sleep. Harney and Sons Tea – Royal English Breakfast – A stout combination of Kenilworth Ceylon, and Kenyan Milima black teas in a smooth, full-bodied brew. Delicious when complemented with milk and sugar. Harney and Sons Tea – Peppermint Herbal – From Oregon comes marvelous, brisk peppermint leaves that produce a great smelling and crisp tasting tisane. Some find that a cup of this can also get a pesky stomach under control in no time. Harney and Sons Tea – Chinese Flower Green – A beautiful blend of green teas and three types of flowers accented with citrus flavors. A joy for the eye and the palate. Harney and Sons Tea – Green Tea with Coconut, Ginger, and Vanilla – The rich flavors of Thailand are the inspiration for this tasty blend. It is a combination of green tea, lemongrass, vanilla, coconut and ginger. Our thanks to Mr. Harney for his years of work dedicated to the beverage he loved – tea! And our best wishes to his successors.